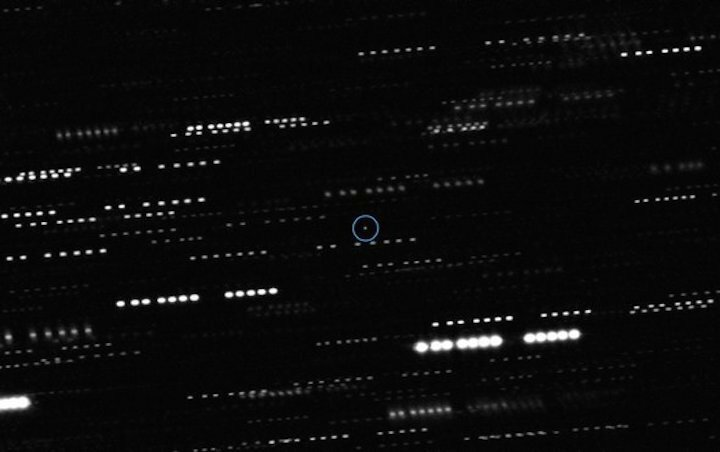 Our solar system’s first-known visitor from another star, the recently discovered object called ‘Oumuamua, could be a bonanza for researchers. With only a brief window of time to observe the cigar-shaped wanderer before it zooms beyond the reach of our best telescopes, astronomers have crammed in observations with the hopes of learning more about this interstellar interloper. Not only is the fast-moving object intriguing in its own right; it may also provide insights about how planetary systems evolve. ‘Oumuamua caught the eyes of astronomers on October 19 this year. Calculations revealed the space rock was traveling at 26 kilometers per second relative to the sun, a rapid clip that along with its extremely elongated orbital trajectory suggested it came from outside the solar system. Telescopes swiftly targeted the object, with most researchers expecting to see a cometary tail trailing from an icy visitor as it approached the sun. But to their surprise, ‘Oumuamua showed none. Instead, it looked more like an asteroid. “It does not a resemble a comet—it had no tail whatsoever," says Karen Meech, who studies comets at the University of Hawai’i at Mnoa. Meech used NASA’s Hubble Space Telescope and other observatories to examine the mysteriously inert space tourist. Asteroid or comet—why does it matter? The answer ties into our understanding of how planetary systems grow over time in their natal “protoplanetary” disks around young stars. Newborn giant planets can jostle one another, using their gravity to push each other around. They also lord their size over their smaller neighboring worlds—and especially over the kilometer-scale objects called “planetesimals” left behind as debris from the planet-forming process. When a giant planet throws its weight around, more than half of these planetesimals can wind up hurled from the system. Because most of a typical protoplanetary disk is icy—in 2016 Meech used solar system observations to estimate there were as many as 10,000 icy objects for every rocky object—icy objects should dominate the ejecta. Location also makes a difference in what gets thrown out. Most gas giants lie on the other side of the “snow line,” a demarcation in a protoplanetary disk where its composition shifts from mostly rock to mostly ice. Objects on the star side are baked dry by starlight and thus predominantly rocky whereas objects on the darker outer side are colder and tend to retain more ice. In our solar system the snow line lies between the orbits of Mars and Jupiter, and astronomers believe that distance is roughly where it started out for other sunlike stars. As outlying gas giants shift their orbits, they become more likely to interact with nearby ices than the more distant rocky material closer-in to the star, adding fuel to the idea that most of the interstellar visitors we observe should be icy—including ‘Oumuamua. ‘Oumuamua’s oddball spin could be related to its origins as well. According to new research posted on the preprint server arXiv.org, the visitor is tumbling willy-nilly rather than smoothly rotating on its axis. The researchers, who declined to comment due to embargo concerns, state in their paper “1I/‘Oumuamua was likely set tumbling within its parent planetary system, and will remain tumbling well after it has left ours.” ‘Oumuamua’s motion, they speculate, could be due to a long-ago collision with another body or the extreme tidal torqueing it may have experienced during its ejection from its parent planetary system. Alternatively, its spin could come from the jetlike outgassing of icy material vaporizing in sunlight—the process that creates a cometary tail. But, again, the object did not appear to sprout a tail when it closely approached our sun. If indeed ‘Oumuamua is an icy body, how did it avoid growing a cometary tail? David Jewitt, an astronomer at the University of California, Los Angles, suspects any ice might be buried under a layer of material damaged by the charged particles known as cosmic rays that bombarded ‘Oumuamua while it traveled through space. “The prolonged exposure will toast the surface,” forming a protective crust, he says. A crust of only half a meter could be enough to shield the ice, Jewitt adds. He calculated how heat could have moved through the object, using solar system analogues because its surface composition is unknown, and found it would not make it very far. “You’d only have to go a meter or two into the surface,” he says, “to reach the ‘interstellar temperature,’”—which is only a few degrees above absolute zero. Unfortunately, we are unlikely to ever know what materials comprise ‘Oumuamua because it is moving far too fast on its way out of the solar system for us to have a realistic chance of catching up to it with even our speediest spacecraft. But it left astronomers excited about the next one; they anticipate spotting about one interstellar visitor a year in the near future. If those objects all wind up being rocky, that could mean bad news for our understanding of planet formation. “If the first 10 [objects] were all rocky, then it would mean we’re really off on something important,” Raymond says. Most likely, it would mean the rocky material makes up a far larger portion of the natal disks than expected by the models. “We’d have to be way off on where planetesimals form,” he says. If ‘Oumuamua is icy, Laughlin thinks it has important implications for Neptune-size worlds in the outer reaches of other planetary systems, which have been a challenge to observe. Because distant Jupiter-size worlds are only found around roughly one out of every 10 stars, he thinks the ejection of ‘Oumuamua-like objects might need a boost from an as-yet-undiscovered population of icy Neptune-like worlds in Jupiter-free systems. No evidence of artificial signals emanating from the object so far detected by the Green Bank Telescope, but monitoring and analysis continue. Initial data are available for public inspection in the Breakthrough Listen archive. San Francisco – December 13, 2017 – Breakthrough Listen – the initiative to find signs of intelligent life in the universe – is reporting preliminary results and making initial data available from its observations of the "interstellar visitor" ‘Oumuamua1. The initial block of observations (the first of a planned four blocks) ran from 3:45pm to 9:45pm ET on Wednesday, December 13, using the Breakthrough Listen backend instrument on the Robert C. Byrd Green Bank Telescope in West Virginia. Listen observed ‘Oumuamua across four radio bands (corresponding to four of the radio receivers available at Green Bank, denoted L, S, X, and C), spanning billions of individual channels across the 1 to 12 GHz range. In addition to calibration observations, the instrument accumulated 90 TB of raw data over a 2 hour observation of ‘Oumuamua itself. A search for signals that may be of artificial origin has begun, but despite the impressive computational power of the Breakthrough Listen computing cluster at Green Bank, the large data volumes mean that this will take some time to complete. “It is great to see data pouring in from observations of this novel and interesting source,” said Andrew Siemion, Director of Berkeley SETI Research Center. “Our team is excited to see what additional observations and analyses will reveal”. The Breakthrough Listen "turboSETI" pipeline2 combs the data for narrow bandwidth signals that are drifting in frequency. By matching the rate at which these signals drift to the expected drift due to the motion of ‘Oumuamua (in addition to rejecting interfering signals from human technology that do not match the sky position of the primary target), the software attempts to identify any signals that might be coming from ‘Oumuamua itself. No such signals have been detected, although the analysis is not yet complete. So far, data from the S-band receiver (covering frequencies from 1.7 to 2.6 GHz) has been processed, and analysis of the remaining three bands is ongoing. A subset of the S-band data is now available for public inspection in the Breakthrough Listen archive3, and additional data will be added as it becomes available. The data is stored in specialized formats, and analyzing it may be challenging for non-experts. We invite those who are interested to study the tutorial material4provided by the Breakthrough Listen science team at the University of California, Berkeley, SETI Research Center and to assist with the analysis not only of this intriguing object, but of the entire Breakthrough Listen dataset. The Breakthrough Initiatives are a suite of scientific and technological programs looking for life in the Universe.